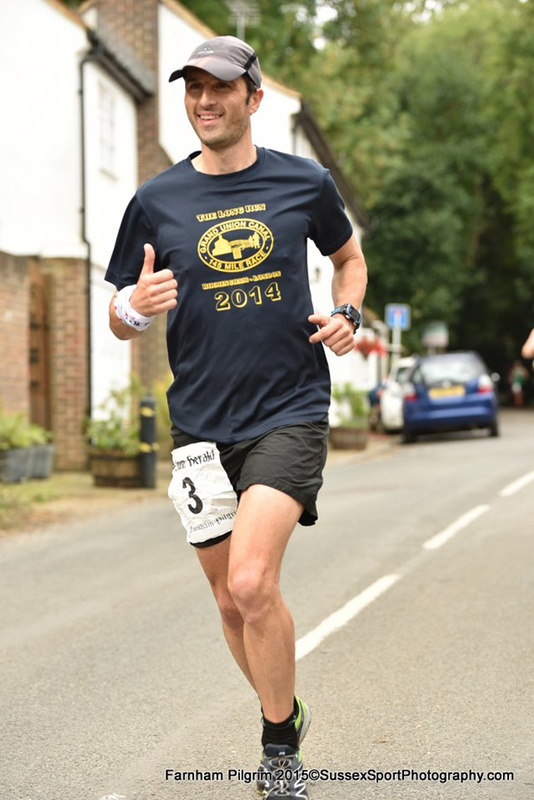 The Farnham Pilgrim Marathon was my last planned warm up event before Spartathlon and due to the proximity of the event I had planned this as a ‘steady to good’ effort. 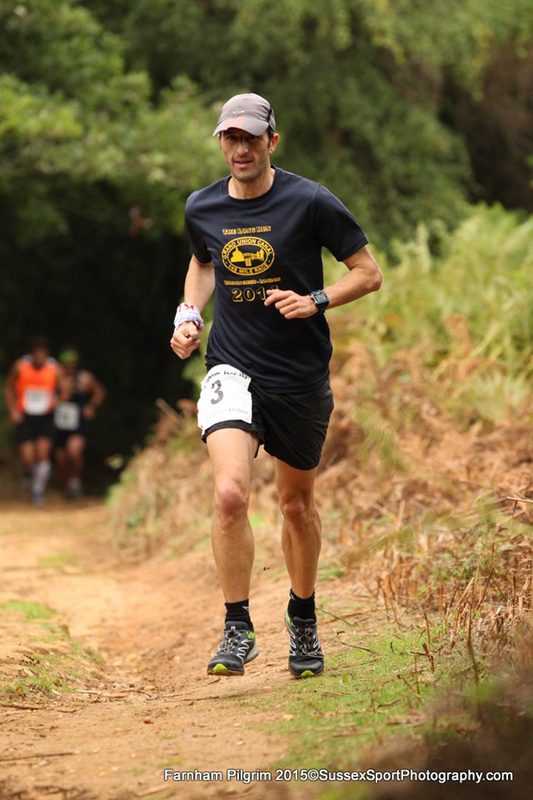 I had run the same race with the same strategy as my last tune up event two years ago before Spartathlon and this would be a good comparison between my level of fitness between both years. I was joined by running buddy Jim Seaton for the event and we made the short (45 minute) journey to the start, registered an hour before the race and caught up with a few people before making our way to the start line. The weather was cool and slightly overcast but there was no forecast of rain so perfect running conditions. 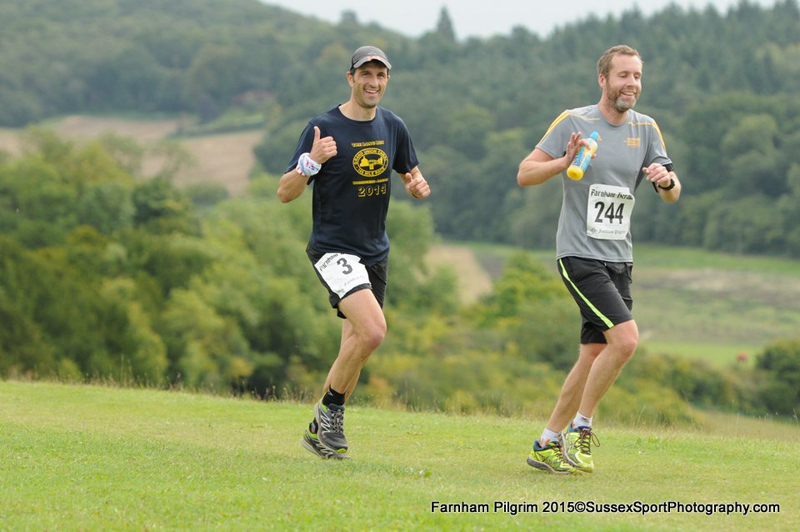 The Farnham Pilgrim Marathon is a hilly, trail event with around 2000ft of ascent/descent over the North Downs and surrounding paths, roads and trails from Farnham to Guildford. Around 250 people take part in the Marathon with a similar number taking part in the Half Marathon event. Jim and I set off mid-pack and followed a group of runners for a mile or two.. I had deliberately set out at a steady pace for the first 2 or 3 miles, navigated a few of the tight trail paths early on before settling into a ‘comfortably quick’ pace. Some of the route was vaguely familiar, some of it was not but the route was very well marked with lots of markings and arrows and a marshal on almost every corner. With almost 200 marshals attending the event and lots of Checkpoints with water and snacks, the Rotary Club of Farnham put on a well organised, well supported event. I drifted ahead of Jim and caught up with a couple of people who I chatted to briefly (hello to Dean, Dave Ayling, Kenneth and others I spoke to briefly) before heading on by myself. I was pretty much drifting past people for most of the race so far as I followed the undulating route. The only niggle was a few road crossings with fast traffic to navigate which meant a couple of stops and start waiting for traffic to pass but this wasn’t a major problem. It’s nice to have an excuse to pause briefly during a marathon! As we reached the half-way point we came to St Marthas Church which involved a gradual climb at first followed by a shorter sharper climb up a sandy hill. My ‘steady effort’ plan had been to run at a pace where I was not out of breath and I felt justified in hiking up that hill at that point aswell as I felt like I was over-exerting myself as I started to run up the hill. At the top there was a nice fast downhill stretch through a forested area which was nice to relax and let gravity take you down although I was carefully looking out for any tree roots and taking lots of short little steps to maintain some control. I ran largely by myself as I continued to drift past people but I was spotting people ahead less frequently by now. The sun came out for a little while making it a very pleasant run in good conditions and I was feeling pretty good overall. The only niggles were the effects of a minor ankle sprain a few days ago and my Salamon Sense Mantra 2 shoes felt a little firm on the road sections but were great on the trail sections. I guess with a mix of both types of ground condition there’s no right answer here. I churned out a few more miles and was heading towards the 18 mile point and another short climb up towards an abandoned ruin. I saw Ben Pittman (and buddy dressed in matching Spiderman running tops) a fellow club runner coming down the hill around the ruins as I was heading up and a caught up with them a mile or so later before drifting on ahead. With a few miles to go, I started to spot a few of the Half-Marathon runners who had started an hour later and taken a slightly different route which eventually led back onto the same finishing section. The timing of the events meant I was approaching some of the steadier runners and after not seeing many people for a while it was nice to spot some runners ahead. There was a heathland section around 22 miles which was the last real hill I recall. I had been maintaining a good pace but started to feel like I was over-exerting myself again (shallow breathing) and I just backed off for 30 seconds and hiked a short section before getting back into my stride. It was just a short pause but I felt better for it and then got my head down to see out the last few miles. With a couple of miles to go I was passing more and more of the Half-Marathon runners before spotting the distinctive running style of Martin Bacon ahead. I had last spoken to Martin at the Thames Ring about the Spartathlon and that conversation in June was as a timely reminder that I needed to get my head down and train for the next couple of months as there were plenty of other people who were desperate for places and I didn’t want to waste one with a half-arsed effort (obviously the results of those efforts are yet to be determined). “Don’t be complacent” has been my motto for the past few months. I managed to drift ahead of Martin and now got a bit of a spurt on for the last couple of miles and finished pretty strongly. I recognised the final lane and path up the hill to the finish and it was nice to see earlier finishers (mainly from the Half Marathon) giving the finishing runners some encouragement. A little push up the hill and a dash for the line and I was done finishing in 3.25 something and 9th place out of 250 runners. Finishing sprint. Photo by Sussex Sport Photography. I was really pleased with the result which was nearly 30 minutes quicker than 2 years ago when I probably gave a similar level of effort (the steady to good effort range) so it was nice to wrap up the block of training with a great benchmark run. Physically, I’ve had a good consistent period of mileage and am feeling fit and ready for Sparta. I just need to get my mind focussed on the race and hope I can give that extra 10% mentally which has been missing in my Ultras this year. I waited for Jim to finish, spoke to a couple of people at the end before heading back home. Thanks to Rotary Club of Farnham for organising the event, it was very well marshalled, well marked and had plenty of checkpoints and was a nice sized event with plenty of people taking part but not too many so it didn’t get too congested. The only minor drawbacks were the odd road crossings and a couple of single file trail sections in parts but these were minor points. I should point out (to the medal whores… which may include me) that the medal is a little small compared to some of the recent Marathon ones I’ve collected. 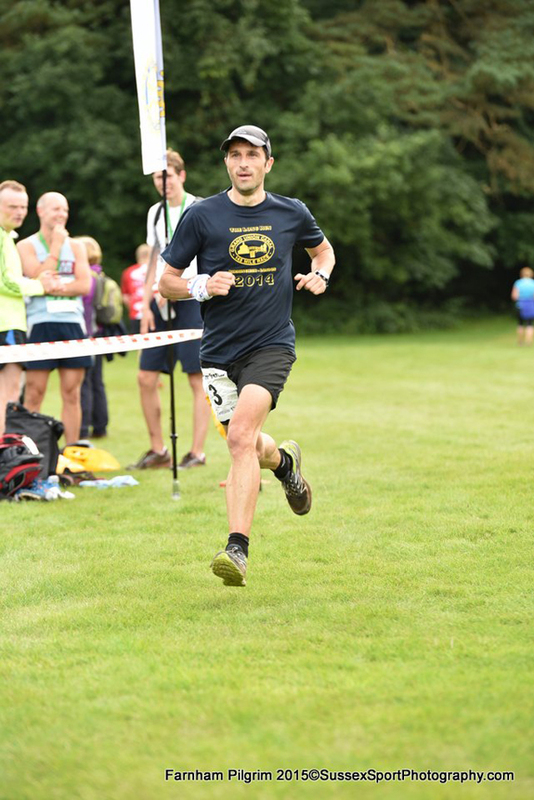 A quick well done to fellow Reading Jogger Ben Pittman who finished his second ever marathon and took 19 minutes of his PB despite this being a hilly trail route. 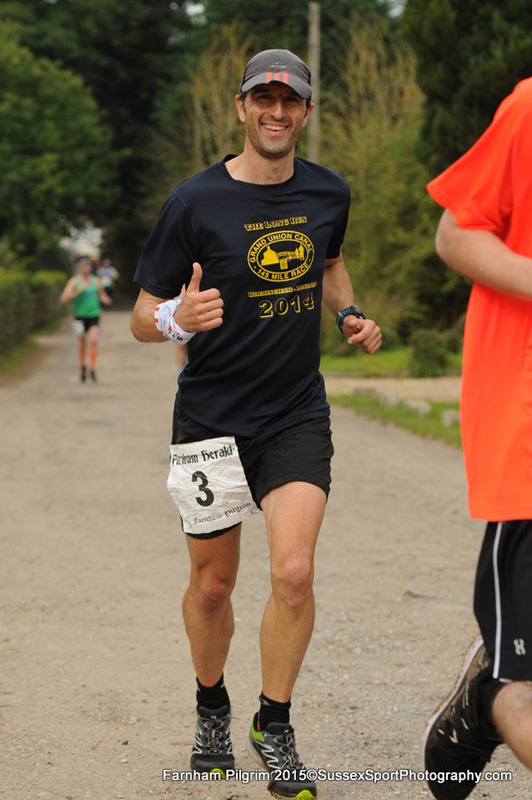 There’s another 10 minute improvement at least on a flat road marathon Ben, no pressure.